We know about the Battle of Wolf 359 in early 2367. We know about what's commonly called the Battle of Sector 001 from First Contact in 2373. But as hinted at in First Contact, there were things going on we didn't know. We've made too many compromises already, too many retreats. They invade our space, and we fall back . . . they assimilate entire worlds, and we fall back. Not again! The line must be drawn here! This far, no further! And I will make them pay for what they've done! This speech always intrigued me, not just because it is frakking awesome, but because it suggests a lot more interplay with the Borg than just Wolf 359, more even than what we could deduce from "I, Borg"[TNG5] set in late 2368. This concept is backed up by Sisko in "In Purgatory's Shadow"[DSN5], noting that "we need all the help we can get. The Dominion picked a perfect time to invade. 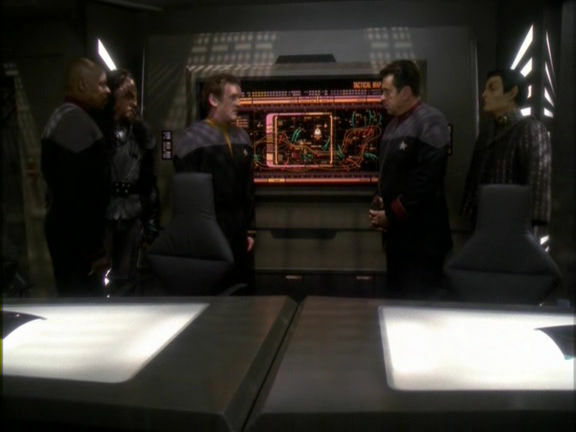 The Cardassian fleet is in shambles, the Romulans are not much better off, and between the Klingon War and the recent Borg attack, Starfleet's spread pretty thin." Most people of course assume that the recent Borg attack refers to Star Trek: First Contact. However, I don't think that's true. For one thing, the stardates don't work. The follow-on episode to "In Purgatory's Shadow" was "By Inferno's Light", and the stardate in that episode was 50564.2. That's the date given after the Dominion fleet goes into Cardassian space with Dukat at the start of the episode, an event which occurred a day or two at least after Sisko's "recent Borg attack" comment. This is also after he Klingons who had invaded Cardassia (including Gowron himself) get smacked around sufficiently by the Dominion to show up at DS9 en masse with tail tucked between their legs, despite it being an enemy outpost at the time. Gowron indicates he still has forces in Cardassian territory, but he has taken a sufficient whipping to sign back on to the Khitomer Accords then and there, which I daresay was somewhat un-Klingon of him. But in any case, it is obvious that a little time should have passed between the arrival of the Klingon fleet and Sisko's original statement, but even if we ignore that extra time, we still have a date of 50564. First Contact, however, is noted as having a stardate of 50893.5 . . . this date doesn't refer to the battle, either. This refers to the report from DS5 about Ivor Prime being destroyed by the Borg, and is the date given as Picard is about to brief his officers that a Borg cube is about to cross the Federation border on a direct course for Earth. The Federation fleet is being massed by Admiral Hayes in the Typhon Sector, wherever the hell that is, and based on the fact that the cube made it to within sight of Earth, it was apparently a running firefight. So in 2373, sometime maybe in the 50550-50564 range, give or take, we hear a Starfleet captain talk about a recent Borg attack. And then in around 50893, about a third of a year (four months) later assuming 1000 stardate integers per year, another Starfleet captain notes that his dread fear of six years is coming true at the moment, as the Borg have begun an invasion of the Federation (which seems rather overstating the matter given the single cube, but whatever). In any case, Picard's log entry may seem to suggest that nothing much had happened in the intervening six years, but then this was the very same captain who found Hugh in late 2368. So, let's ponder his awesome speech a bit further for a moment. "They invade our space, and we fall back" . . . sure, that could be a reference to the fact that Starfleet always pulls back to a defensive position such as Wolf 359 or the Typhon Sector to amass a fleet, but that interpretation leaves the line kinda lame. Of course you're gonna gather a fleet a little ways back when a fast juggernaut is coming. On the other hand, the Federation did send the Enterprise-D to check out the six uninhabited star systems of the Argolis Cluster as a prelude to colonization in "I, Borg", and it is entirely possible that when they became aware of Borg scout ships skulking about they thought better of the idea. But that's hardly a thought as awesome as the line itself. I mean, for that line to really work, you'd have to have the equivalent of seeing Borg on the Florida Keys and having the US pull back to a Tampa-Orlando defense perimeter. "They assimilate entire worlds, and we fall back" . . . well, what worlds have they assimilated? Jouret IV at the start of "The Best of Both Worlds"[TNG3]? That was the Federation's most distant colony . . . it doesn't seem like that would've involved a lot of retreating. The Federation and Romulan outposts from "The Neutral Zone"[TNG1]? I don't see that being a situation where either side would really fall back. No, it seems to me that there must have been other things going on. Obviously, small Borg scouts skulking about in 2368 near Federation space would have implied a Borg presence in the area. As for what area that might be, we have several clues. For one, Admiral Hayes amassed a Federation fleet in late 2373 at the Typhon Sector. We've never heard of that again, but we have heard of the Typhon Expanse. 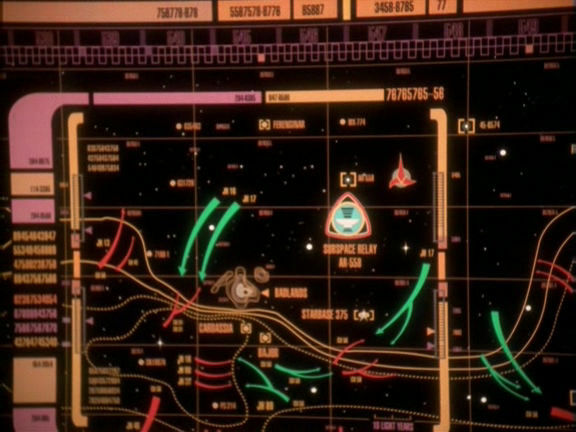 There's even a map of the Typhon Expanse in "Cause and Effect"[TNG5], but until I see higher definition screencaps I can't say anything more about it. So where is the Typhon Expanse? Well, a couple of episodes earlier the Enterprise-D was near the Cardassian border, as deduced by the fact that she responded to the distress calls of the USS Denver in the Beloti sector when the Denver had struck a mine left over from the Cardassian conflict. While they could've gone a good distance in the intervening 70 stardate units (after all, it took just 50 stardate units to get to Earth for "The First Duty" which follows "Cause and Effect"), this does at least hint at the notion that they were somewhere close to the Cardassian sphere of influence. This is also hinted at by "I, Borg"[TNG5] . . . the Borg scout crash site is near or within the Argolis Cluster, which was used in 2374 as a blind by the Dominion to hide a sensor array on the other side of it ("Behind the Lines"[DSN6]. While I suppose the Dominion could have hidden a sensor array clear on the other side of nowhere, it seems that they would hide one reasonably close to their Cardassian territory so as to keep an eye on the conflict zone and nearby regions. As noted, the sensor array let them monitor ships across five sectors, and it could even detect cloaked ships at a range of a couple of light-years. The plot of "Behind the Lines" strongly suggests it was only a day or two from Starbase 375. This is useful because 375 was the staging point for the retaking of DS9, which was roughly three days away per the next episode, "Favor the Bold" (not accounting for fleet departure prep and ginormous battle time). Indeed, this map of the Cardassian War as seen in "When it Rains"[DSN7] (and often shown virtually identically in shape but as a Dominion map) suggests that Starbase 375 is around 29 light-years from Bajor. (Just a note, but that would be around 3500c for the Federation fleet's speed, assuming 29 light-years in 72 hours, which is a bit conservative. And, as long as we're here, this larger view suggests that late in the war, Cardassia occupied a space around 250 to 275 light-years wide at maximum extent, give or take . . . The Argolis Cluster does not show up in the map, however, and neither does the Typhon Expanse. Based on our speculation thus far it would seem like they both should, and that perhaps the Typhon Sector is perhaps several days away from Bajor and DS9. So what have we learned here? Well, it seems reasonably solid that "I, Borg" happened relatively near Cardassian space. As for whether the Borg cube from First Contact came from the same direction, I'd say the evidence is thin on the ground . . . the Typhon Sector and Typhon Expanse may be completely unrelated, in which case First Contact might have absolutely nothing to do with that side of the Federation at all. However, if it did, then the Borg may have been flitting about doing who knows what in the direction of Cardassia and Ferenginar. Recall that in 2364, the Enterprise-D was headed out to explore the "great unexplored mass of the galaxy" past Deneb. If the galactic center is "north", then that's "west". The Federation was also interested in the as-yet-unknown Ferengi possibly being involved at Deneb, and they later met the Ferengi. Ferenginar shows up on that map above . . . it's hardly beyond the pale to ponder that the Enterprise-D might've been exploring "the great northwest" in early 2364, with Cardassia as a sort of Baja California area toward the southwest. And it wouldn't be a shock for the Borg to be roaming around that same area, or perhaps even a bit more northward, in 2368. So, rolling with our "Borg in the Northwest" hypothesis, what might've been going on? I wouldn't surmise anything extreme like a thriving Borg planet or unimatrix or any other such thing, nor would I even argue that cubes were present at all, but it is pretty definite that there was Borg traffic in the Alpha Quadrant. I would hypothesize this continued into the 2370s, and that the Federation must have withdrawn from certain areas that suffered minor Borg incursions a la the 2368 Argolis incident or from the areas of distant extra-Federation worlds or colonies that were annihilated. But let's remember, too, that Sisko suggests losses from the recent Borg attack four months before First Contact. This strongly suggests that there was one occasion where multiple ships were lost. Or does it? Sisko notes the recent Borg attack as being a reason Starfleet is spread pretty thin, but that in and of itself does not necessarily prove losses. Picard notes that they invade Federation space and the Federation falls back, so they may very well have prudently avoided confrontation as much as possible, but still repositioned part of the fleet in a defensive posture a set distance from that area. Either way, you end up with a Federation whose western resources were probably stretched to the limit, with ships needing to be at the Cardassian border, and also some point toward the northwest, and of course the Romulan Neutral Zone patrols back east, and so on. Sisko's speech really nails that point home . . . it was indeed the perfect time for a Dominion invasion. I would surmise that the Borg must have been sighted or heard of, presumably outside Federation space for the most part. It's possible, perhaps even plausible, that the Federation learned of some colony world (of theirs or someone else's) being assimilated in early 2373 while they were engrossed in hostilities with the Klingons. The world was probably off in the boonies somewhere not immediately relevant to the Klingon War, the Dominion's presence, et cetera. If the Borg were't on a direct course for Earth, then the Federation might very well have decided to evacuate that area and dig in a bit further back. A significantly sized task force patrols the area or is proving relief to the ally or somesuch, and maybe that taskforce gets wiped out by the Borg, or maybe not. Maybe the area is evacuated, maybe folks are left to fend for themselves . . . either way, the Federation withdraws rather than contest the space with the Borg. If there was a battle, you could end up with something smaller than or perhaps equal to Wolf 359 but which, in the larger context of the times what with the Klingon War going on, is just par for the course in their version of newspapers. A tale like that, or similar, would certainly serve to explain why Picard was acting like a lot more had gone on than merely a really scary Borg incursion one time, but that instead he had been living in fear and rage. It would also serve to explain why Sisko suggested a recent Borg attack four months before First Contact. In any case, this notion that the Borg were still lurking about fits a few details. For one, the Borg Queen still had quite an interest in assimilating Species 5618 (Earthlings), even creating a new assimilation technique with them in mind a year or two later ("Dark Frontier"[VOY5]. Two, assimilating nearby or outlying worlds would fit the Borg pattern which saw them cruise down the Neutral Zone picking up bits as they passed. Three, the Borg had assimilated distant but not shockingly distant worlds as soon as the 2290s or thereabouts, given the El-Aurian refugees in Generations. This is all to say, the Borg were still lurking about, but First Contact was the first major attempt to take Earth since "The Best of Both Worlds". In other words, the Borg had been watching, biding their time. It is not known what made them decide to come in 2373, but perhaps they had come to realize that the Federation was distracted by the Klingon war and perhaps that the Dominion was coming. There are a few details left to ponder, such as figuring the timing of First Contact and checking on the status of the Defiant in DS9 episodes around that stardate . . . if she's missing, it makes perfect sense, and even moreso if the rest of the crew is off doing something else. On the other hand, if they were on her at the same time, it wouldn't.fit. Another detail to consider is that if the Borg were around the Alpha Quadrant circa 2373 as the buildup to the Dominion War began, one wonders if there wasn't an encounter between a small Borg ship and a Dominion vessel. That would be interesting, to say the least. Update: A potential flaw in the Typhon Sector = Typhon Expanse argument is that the Enterprise-E was initially 3.5 hours or so from the Typhon Sector rendezvous at maximum warp, assuming that's what Data was talking about when he was cut off by Picard saying they weren't going. The flaw is that it doesn't make a great deal of sense for the E-E to have had to cross virtually the entire Federation to go play with Romulan space dust . . . but on the other hand, if the E-E was anywhere near the Typhon Sector, and given that they wanted Picard away from it, that might actually work like gangbusters. In any case, it took long enough for the E-E to get to the Neutral Zone that they had just completed their first sensor sweep right around the time the battle started. At that point the Borg were traveling at warp 9.6, though, per the comm chatter, so it may not have involved terribly much time passing . . . after all, "The Best of Both Worlds" features the Borg and the E-D getting to Earth in mere days from the Federation's (former) most distant colony world. It's a potential flaw, but not a fatal one.